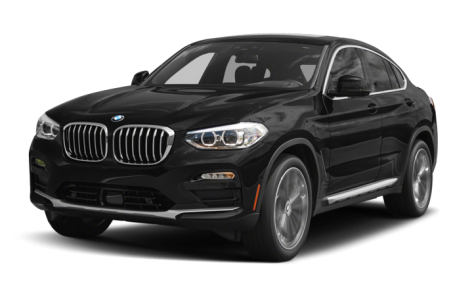 The 2019 BMW X4 is a luxury compact SUV that seats five passengers. This year, it has been redesigned with a more simplified front-end, while retaining its signature fastback coupe profile. Maximum cargo capacity is 49.4 cubic feet with the rear seat folded down. Two trims are available: the 30i and M40i. The X4 30i is powered by a 248-hp, turbocharged 2.0-liter four-cylinder engine, while the M40i receives a more powerful 355-hp, twin-turbocharged 3.0-liter six-cylinder. Both engines are mated to an eight-speed automatic transmission and all-wheel drive.